It’s hard to pin down someone with the name Ivy. Just when I thought I’d found her, first in Oz, then in Wales of all places, she pops up in New Zealand where she’s taken root for now. I’m always a little envious of global souls, like Ivy. It seems like one of life’s greatest freedoms and pleasures, getting to know new cultures and peoples. Ivy and I came together on Clare Carlin’s elegant blog Pieced Work but I have long admired Ivy’s poetry for its muscle and mischief. Full of the Christmas spirit and remembering the joy of decorating the mantelpiece with ivy in a northern clime, I bring you the ultimate pop-up poet, Ivy Alvarez who tells us how Michael Jackson danced into her latest collection. Merry Christmas! And could you comment on who or what influences your practice, Ivy? While putting together the final incarnation of Disturbance, I kept thinking about Michael Jackson’s album Thriller, how every song released from it found its audience. I always keep that in mind. I find it helps me trim the dead wood from a manuscript. For poetry, Sylvia Plath is my foundation stone, as are Dorothy Porter and Ai. I will continue to build and create because of what I’ve learnt from them, and from the future influences I hope to still discover. 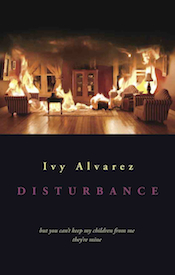 Ivy Alvarez is the author of Mortal (2006) and Disturbance (Seren Books, 2013). Both Literature Wales and the Australia Council for the Arts awarded her grants towards the writing of Disturbance. She is both a MacDowell and Hawthornden Fellow, whose poems appear in anthologies and journals in many countries and online, including Alquimia del Fuego (Spain, 2014), Best Australian Poems (2013), and A Face to Meet the Faces (USA, 2012). 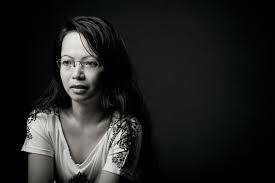 Several of her poems have been translated into Russian, Spanish, Japanese and Korean. In the past few years, she has received invitations to speak at the Oxford Literary Festival, the Dylan Thomas Festival (UK), and the Seoul International Writers Festival (Korea). Born in the Philippines and raised in Australia, she spent time in Scotland, Ireland and Wales, before settling in Auckland, New Zealand in 2014.